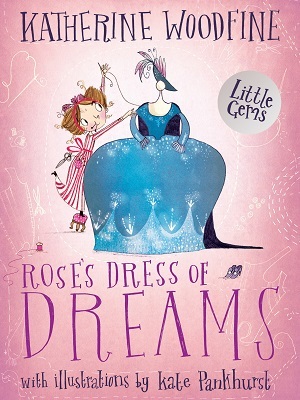 There may be plenty of books featuring biographies of amazing women jostling for space on the shelves at the moment, but for children looking for a short contained fiction that does the same job, accompanied by sensational illustrations, they’d do well to pick up Rose’s Dress of Dreams by Katherine Woodfine, illustrated by Kate Pankhurst. Based on the life of Rose Bertin, the woman credited with creating haute-couture, this is a divinely illustrated historical fiction of determination and dreams. Woodfine expertly weaves the story of Rose’s passion and abundant energy as she transforms herself from a young apprentice into a budding businesswoman. In the face of rejection, Rose triumphs through her own hard work, and changes people’s negative mindsets as she does so. In the face of doubt and drudgery, Rose still dreams of fabrics and ideas of style and by the end is dressing royalty. There’s some imaginative wordplay that sweeps the reader along, with Woodfine drawing on all the senses as she describes the sensuous business of dressmaking. But there’s also plenty of spark and personality as the reader learns that clothes can bring confidence to the wearer, and that friendship and manners play their part too. Pankhurst’s illustrations do far more than just complement the text. Known already for her portraits of famous women in children’s books, and also for her flair for historical detail, here she draws the furniture and chandeliers of the time, matching them with Parisian architecture, and of course fashions. Together, Woodfine and Pankhurst have created a truly shining gem of a book. What’s more it’s a Little Gem by Barrington Stoke, so perfect for even the most reluctant of readers (this is short fiction with bite-size paragraphs and tinted pages). 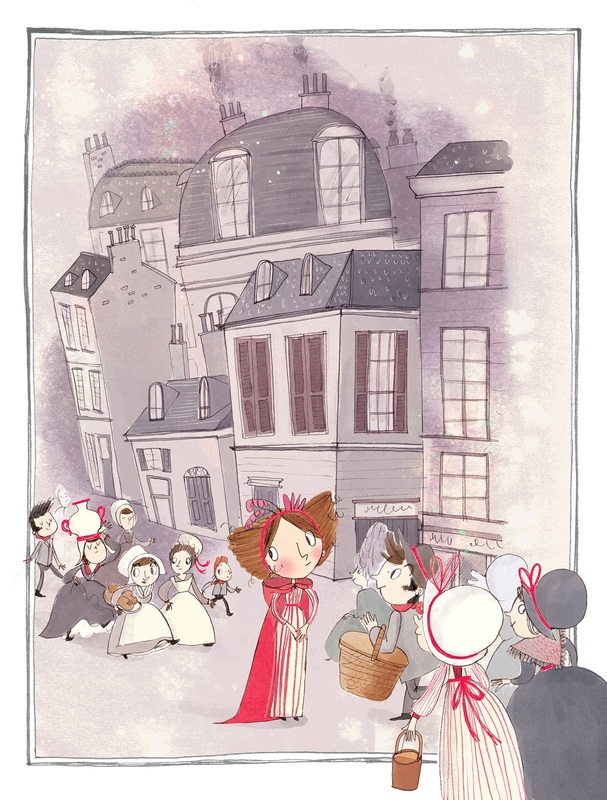 I’m delighted to showcase a Kate Pankhurst illustration from the book – this one is from page 16, beginning Chapter 3: The Streets of Paris. And you can buy your own copy here.